The first evening of Year 13 Music Recitals takes place this Wednesday (25th March) from 6.15pm in the main hall – family, friends and members of the public are more than welcome to come along. This entry was posted in News on March 23, 2015 by rbutler. The DVDs from the live TV broadcast that the Wind Band performed in Monnickendam in July will be with us by the end of the day on Tuesday according to UPS. The price of each DVD will be £11 due to the additional tax that we have to pay in Holland. If you wish to purchase a DVD cheques will need paying to “Friends of UVHS Music”. This entry was posted in News on March 20, 2015 by rbutler. Tonight’s rehearsal is cancelled due to the Primary Dance Platform. There WILL be a rehearsal next week (despite being the last day of term) and it will go on until 5pm in order to make sure that new material for the gig at Lower Holker is prepared. 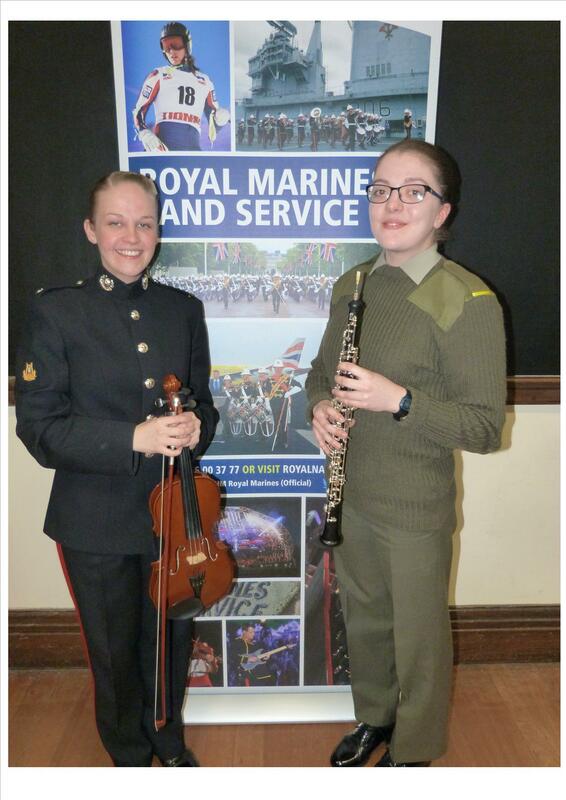 We were delighted to welcome back to school this week our former music students, Ruth Tarr and Jodie Giles, from the Royal Marines Band Service. Ruth has just passed through the RM School of Music (having studied violin for 4 years at the Royal Scottish Conservatoire) and joins the Plymouth band in a few weeks as solo violinist and also saxophonist. Jodie joined up in September and, having just completed her basic Marines training, is at the School of Music and has just started learning the oboe – in 2 months she has gone from complete beginner to Grade 5 standard! Ruth very kindly took Sax Ensemble yesterday and String Ensemble today, passing on some really good advice to our players. Both Ruth and Jodie played with Wind band and gave a short presentation about the Band Service as well as taking questions from students after the rehearsal. Hopefully we will see more of the band service very shortly!!! This entry was posted in News on March 17, 2015 by rbutler. well done to the Swing Band for a great performance tonight. The students make me exceptionally proud to be associated with them! This entry was posted in News on March 13, 2015 by rbutler. A reminder that the concert tomorrow evening (Friday 13th March) at Aldingham Church starts at 7pm – band members must be there by 6.30pm at the latest to organise their pads. The set list features songs from Florrie Dobson, Ben Lewis and Libbie Blackhurst, including the new Michael Buble arrangements. Entry for the public is £5 on the door. Refreshments at the interval. Please promote with friends and family – it would be great to get a full house!! This entry was posted in News on March 12, 2015 by rbutler. Apparently, the long-awaited DVDs of the Wind Band concert in Monnickendam, which was broadcast live in Holland, will be here very soon. Attached is the artwork for the sleeve. This entry was posted in News on March 8, 2015 by rbutler.